Imagine the pride at being in a crowd where everyone is standing shoulder-to-shoulder, united over hunting and the Second Amendment. That was the scene in the Mossy Oak booth at the SHOT Show in Las Vegas, Jan. 22, as Mossy Oak and the NRA unveiled OVERWATCH—“Designed to Conceal, Created to Defend”—the official new camouflage pattern of the NRA. Looking forward to promoting the OVERWATCH pattern as NRA Publications executive director, Doug Hamlin acknowledged the key players at Mossy Oak and recognized the NRA leaders in the crowd, including past NRA President Jim Porter and NRA board member, Army paratrooper and country singer Craig Morgan, before calling attention to “one of the all-time greatest American warriors:” NRA President Lt. Col. Oliver North. 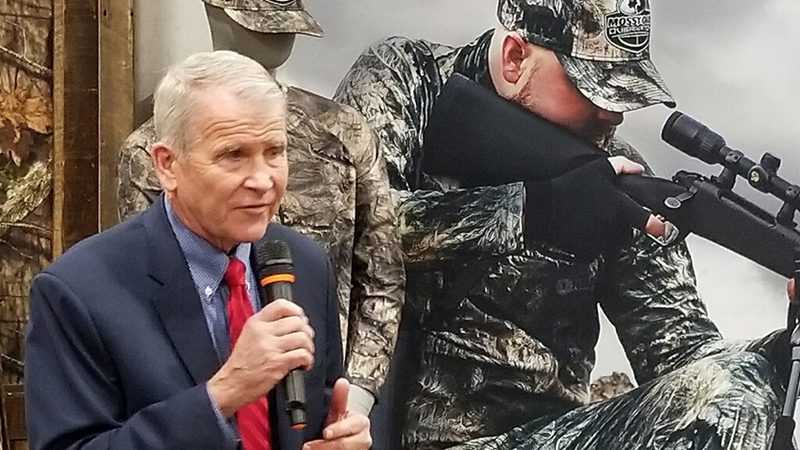 NRA President Lt. Col. Oliver North addresses a crowd at the launch of the Mossy Oak official NRA OVERWATCH camouflage pattern at SHOT Show on Jan. 22, 2019. "I just want to thank all of you for investing in keeping the Second Amendment alive and advancing the shooting sports,” said North, a combat veteran and recipient of the Silver Star, Bronze Star and two Purple Hearts and who assumed the NRA presidency in May 2018. North explained he took the helm to stand and fight to save hunting’s future so our children and grandchildren can enjoy our same freedom to hunt and own firearms. “I’m pretty sure every one of my 17 grandkids will have Mossy Oak,” North added as the crowd got a firsthand look at the new camouflage of the NRA, which will be available on clothing, firearms and accessories later this year. As the “official camouflage partner” of the NRA, Mossy Oak developed the OVERWATCH pattern exclusively for the NRA. The revolutionary pattern highlights cutting-edge design technology with three-dimensional modeling and features the NRA logo embedded in the pattern so American hunters can show their passion for their all-American right to keep and bear arms and their support of America’s hunting and outdoor heritage. Now we members of the collective hunting community can make sure the camo on our backs has our backs. Mossy Oak has supported the NRA since its founding in 1986 and, no doubt, will have our backs into the future in more ways than one.